So when we have 2 nodes, if there is a network issue between the two servers, the cluster will be split in 2 partitions. And each of it will have 50% of the amount of total members (1 of 2). Is 50% > than 50% ?? No! 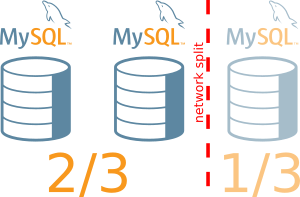 That’s why none of the partition will reach quorum and none will allow queries in case of MySQL InnoDB Cluster. Indeed, the first machine will see that it won’t be able to reach the second machine anymore… but why ? Is the second machine who died ? Am I having network interface issues ? We don’t know, so we cannot decide. Our cluster will still be able to serve transactions has one partition still has quorum (2/3 = 66%, which is bigger than 50%). There is a very important concept I want to cover as this is not always obvious. The cluster is different in InnoDB Cluster and in Group Replication. 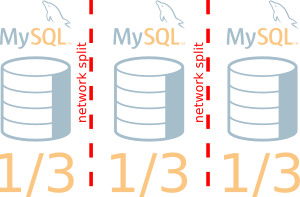 Indeed, InnoDB Cluster relies on metadata created by the DBA using the MySQL Shell. Those metadata describes how the cluster has been set up. Group Replication sees the cluster differently. It sees it as it was last time it checked and how it’s right now… and updates that view. This is commonly called, the view of the world. In this case the MySQL service won’t work properly until a human fixes the situation. and cannot process write transactions. This process is explained in the manual (Group Replication: Network Partitioning). Be careful that the best practice is to shutdown the other nodes to avoid any kind of conflicts if they reappear during the process of forcing quorum. The other option is to use the adminAPI from the MySQL Shell. This is the preferable option of course ! With the AdminAPI you don’t even need to know the port used for GCS to restore the quorum. When for any reason you have lost quorum on your MySQL InnoDB Cluster, don’t panic. Choose the node (or list of nodes that can still communicate with each others) you want to use and if possible shutdown or stop mysqld on the other ones. Then MySQL Shell is again your friend and use the adminAPI to force the quorum and reactive your cluster in one single command !